Foto Yeraz*, an extension of my quest for new meanings in the tradition of studio photography and its connection to my Armenian identity, is a fictitious and vacant photo studio, where figures are absent, but spatial elements, such as large scale backdrops and props, still continue to exist, in fact they convert from serving as objects and start acting as subjects instead. Backdrops, depicting romanticized spaces, resist the documentary claims of photography and therefore create a constant dichotomy between the real and the fake. I utilize actual photographs of existing photo studios, and various textures from Beirut’s Armenian surroundings to create the uncanny backdrops of Foto Yeraz, where I examine the cultural survival of the community and how they sustain their social identity. 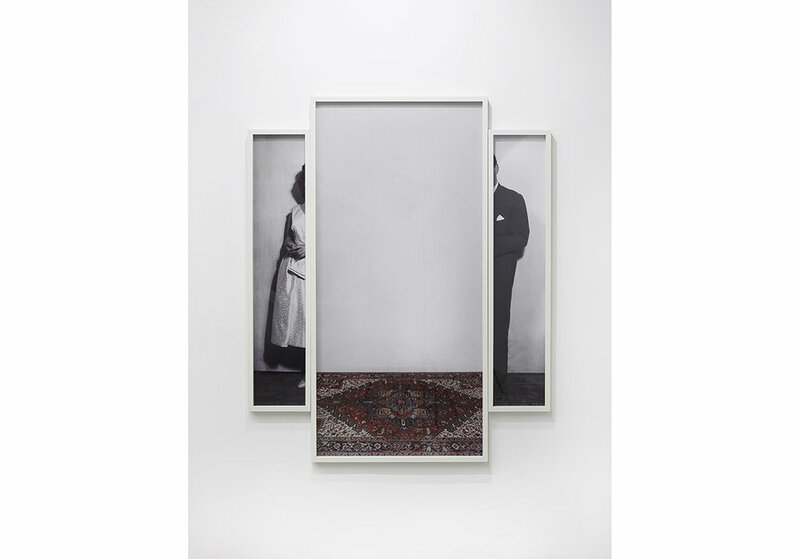 Places You Haven’t Been starts with the artist’s random discovery of a studio photograph of her father, taken by Maryam Sahinyan at Foto Galatasaray in 1959. The familiar photograph has been divided into two parts, turning into an anonymous image and making room for a middle panel depicting spatial fantasies about that same exact studio space. The work aims to hint at the idea that photographic spaces are meant to be perceived differently at various time frames. This triptych acts as an entrance point to Foto Yeraz. Bourj Hammoud, a town founded by survivors of the Armenian Genocide, represents an attempt for socio-economic reconstruction and cultural survival from a dispersed community that still lacks the sense of unity. Mountain of Foto Yeraz, consisting of photographs taken in Bourj Hammoud serves as a backdrop in the fictitious and vacant photo studio, Foto Yeraz, where figures are absent, but spatial elements, such as props and large scale backdrops still continue to exist. Following the fragmentary and metaphoric nature of backdrops; storefronts, signs and various textures accumulate to form the anonymous mountain, reminding of Ararat and the dream of returning home. Yet the rupture in-between hints at a failure in completion of achieving this dream. This piece borrows shapes and textures of actual props that were used in historic photo studios, attempts to recreate them in life-sized yet two-dimensional forms and shifts their position from serving as objects into becoming actual subjects. Oscillating between the fake and the real, it aims to underline the dichotomy between the realist claims of photography and the counter-reality of studio settings. This example brings together sculptural elements from three different studio practices that existed in Lebanon during 1940’s - 1970’s; Antranik Anouchian from Tripoli, Fouad Bendali Ghorab from Beirut and Anis el Soussi from Saida. Historical photographs are taken from the Arab Image Foundation online database. Studio Sunset is a photo studio in Bourj Hammoud owned and run by George Dervishian, an Armenian studio photographer, born in 1949 in Aleppo, Syria. Before switching to digital, the small studio carried out traditional photo practices and still holds on to the classic studio appearance. However Dervishian mentions that people nowadays only walk in for passport photos with mostly white backgrounds. Studio Sunset’s workspace finds itself as a backdrop in Foto Yeraz, emphasizing the romanticised quality of such studios and their former working methods as well as their clientele. 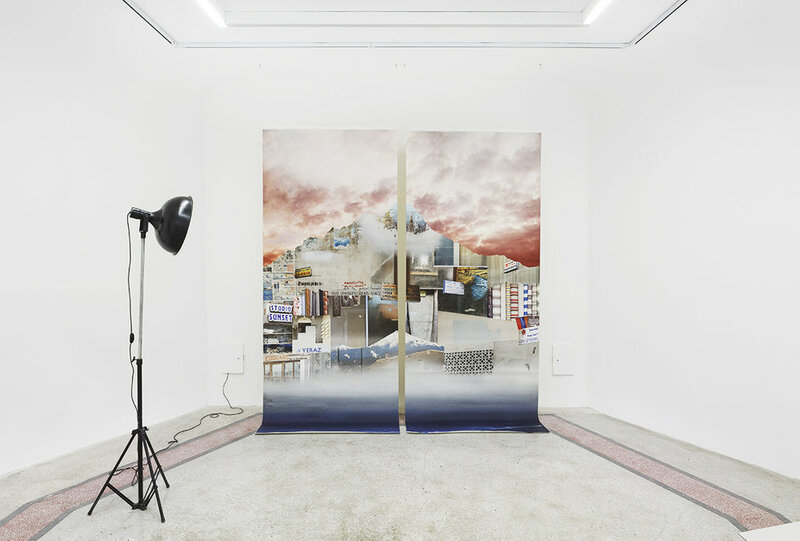 Just like backdrops used to depict space typologies rather than a specific location, as a witness to social and cultural transformations, Studio Sunset, represents all genuine photo studios and their fading characteristics. *Yeraz means “dream” in Western Armenian.